Securing your valuables while traveling can be a challenge. The hotel deposit box will take care of things you don't need day to day, but if there isn't one available, you don't trust it, or you need to carry cards, cash, and passports around with you for any reason, you need to find a way to keep things safe on your person. Here are some wearable ways to keep things secure when you're on the move. Money belts come in a few different sizes and styles, and some are better than others. Traditional zippered money belts attach around the waist and sit under your clothes, meaning they stay hidden most of the time as you move around. Large enough to carry passports, money, and other small valuables, they can become quite sweaty and uncomfortable, especially in hot climates or if too much stuff is packed inside. Also, since they've become so commonly-used, thieves have wised up and will often tell intended victims to lift their shirt up to check for the presence of a money belt. Waist wallets are similar to traditional money belts but attach to an existing belt loop instead. They are usually tucked down the front of a pair of shorts or trousers and have the same pros and cons as standard money belts. A more discrete option for storing currency is the belt wallet, typically a small zippered compartment at the back of an otherwise normal leather or fabric belt. A few folded notes sit lengthwise inside the belt pocket, out of sight of all but the most determined thief. There's no room for cards, passports, or anything else, however, so you'll need an alternative approach to secure those. Easier to hide than a money belt, neck pouches hang down inside your shirt to keep valuables out of sight. They work best with shirts and tops that don't have a low neckline, so the cord can't be easily seen. Neck pouches tend to come in one of two sizes, a larger version that fits passports and documents, and a smaller size for money and cards. Unless you're traveling in cooler climates and will be wearing multiple layers, don't pack too much into these pouches, as they can become visible through light clothing. Try to find a model with an adjustable cord, so you can wear it in a way that suits your height and clothing. Shoulder and body pouches sacrifice accessibility for security, strapping onto your body and clothing in various ways to keep everything as secure as possible. As the name suggests, shoulder pouches fit over the shoulder and under your armpit to keep valuables close at hand. Some models are designed to be used under a jacket, but for maximum security, look for ones that sit against the skin and can be used with pretty much any clothing. For securing slightly larger items, consider hidden body pouches instead. Similar to shoulder pouches, they tend to hang a little lower and sit on one side of the body at around stomach height. Women have also got the option of a "bra stash", a soft pouch that clips onto almost anywhere on a bra strap and can be used to store cash, ​cards, and other small items. If the upper body options aren't ideal, due perhaps to ​discomfort at higher temperatures, consider a leg or arm wallet instead. These typically use Velcro to strap fairly tightly around the upper arm or various parts of the leg and are kept hidden beneath a shirt or long pants. The leg versions are easier to keep hidden than the arm-based models, so are the better pick security. Look for wallets that have plenty of strong Velcro to secure them in place, as the last thing you want is for them to slide off your leg as you're walking around. The most important thing to remember about all of these accessories is that they're only any use if they stay out of sight, so don't store things in them you know you'll need regular access to. Instead, keep a small wallet or purse to hand, with a single card or small amount of cash inside, just enough to cover your needs for the day. If you don't want to bother with any of the hidden belts and pouches, but would like a little extra security nonetheless, there is one final option. Wallets are an attractive target for pickpockets, especially when stored in back pockets or loose-fitting clothing. To keep unwanted hands off your money, a few companies make anti-theft wallets designed specifically for travel. These typically include a slash-proof metal chain that can be securely attached to a belt or bag loop, preventing it from moving more than a few inches without your knowledge. The chains are typically long enough to still be able to use the wallet comfortably when required, but a thief won't be able to make off with it. 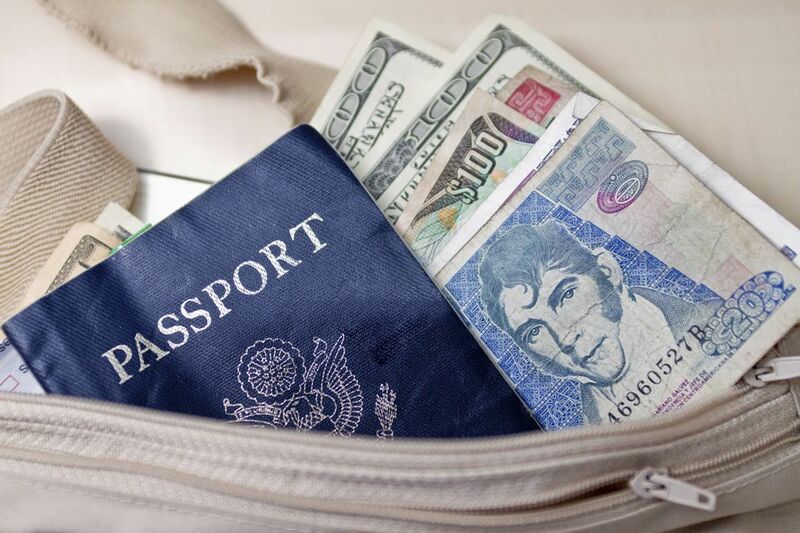 Be careful, though: your life and safety are more important than a passport or wallet, and you can risk antagonizing a mugger by being unable to quickly hand over valuables when required.